In the last days, there has been some discussion in the Finns Party concerning Immigration. As reported by the Helsinki Times, Jussi Halla-aho, a Finns Party representative on the European Parliament, has recently criticized the attitude Timo Soini, its leader, indicating that “The party leadership has been reluctant to address the issue. Chairperson Timo Soini, for example, has noted that he is personally not interested in immigration. I feel that our support base strongly disagrees with Soini on the issue”. Timo Soini answered that immigration issues will be a part of the Finns party platform. This exchange could appear as a consequence of the party losing continuously support in the polls since 2012, going from more than 21 % of votes to around 14 % in 3 years. This certainly creates an internal debate. It may be the case, but from my point of view the debate reveals the gap between the left wing and the right wing of the Finns party. The interesting part is that Timo Soini added that “The single biggest problem for me are the millions of Finns who earn around 1,000 euros”, which is typically a left-sided statement. Halla-aho sees immigration and particularly Muslim immigration as the main problem for the country. On this basis, it is quite difficult to define the line of the party, as the two leaders have different opinions. In fact, it is interesting to note the personal differences and similarities between the two men, and how much they differ from the majority of their voters, which may be important for the future of the party. Timo Soini, 52, has a master in political science, and he has been a politician since 1989. He lives in the same Helsinki suburb in Kaita since 1968. He is criticizing Finland’s immigration policy, but is not known, like other populists leaders in Europe, and Halla-aho, for offensive exaggerations. As he has recently posted on his blog: ” I am probably better to speak about the EU and the problem of social justice“. He is a strong critic of the EU as it functions now, even if he has also been living 5 years on EU salary as a Member of the European Parliament, and is an advocate of the fight against poverty. Once asked about his family, he indicated that his father was more a social-democrat and that he could also have been in the social-democratic party. he is more known for his quality as a debater than for Halla-aho style’s exaggerations. These two leaders of the Finns party are quite different from their base: in his article “The breakthrough or Another West European Populist Radical Right Party? The Case of the True Finns“, David Arter indicates that the level of education of the supporters of the True Finns is relatively low. 53% have completed vocational school or college-level education, and 27% have completed only comprehensive, middle or primary school. Only 5% have a university education. But Arter notes also that the supporters of the True Finns are, according to a survey done in 2008-2009, on average well off, middle-aged male wage-earners and the supporters of the party are doing well financially, which may be a problem for Soini’s social orientation. This may have serious consequences on the party’s positions concerning immigration, and could give Halla-aho some advantage in the debate with Soini: when an increasing number of immigrants arrive in Finland with a solid education, the problem of the Finns’ party voter is more about their own comparative disadvantage than about poverty, because from their point of view either immigrants find a job that should have gone to native Finns, or they benefit from the social support, financed by taxes payed by people working. So why is Soini, who is a clever person, not totally endorsing Halla-aho’s positions concerning immigration? A first element may be personal ethics, that I believe Soini has. A second reason is that there is a serious risk for the future of the Finns’ party: violent attacks against immigration may lead some people to attack immigrants in the name of the Finns’ party, and that could be disastrous in a country where a proper behavior is important. 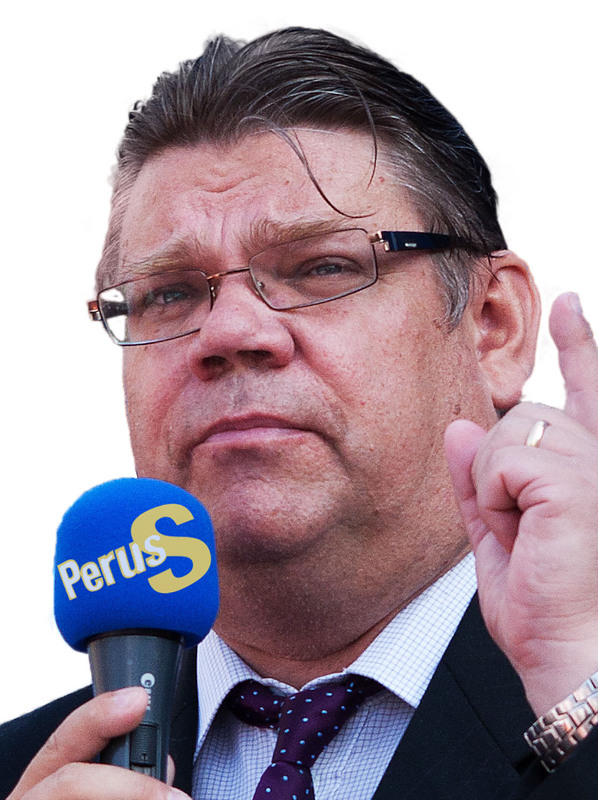 There is also the question of the development of the Finns’ party: it is quite difficult to get votes from the center, where the Center Party has benefited from some years in the opposition and from a good leadership, so Soini’s strategy may be now to continue to get votes from the formers voters of the Social Democratic Party, weakened by its participation in an unpopular government , its apparent support for Juncker’s liberal EU and its involvement in applying an unsuccessful economical liberal programme. In addition, facts may be annoying for Halla-aho supporters. A recent OECD report on the Fiscal and Economic Impact of immigration on host countries arrives to some interesting conclusions, in particular that immigrants have a broadly neutral impact on the public purse in OECD countries, receiving in state benefits around about as much as they pay in tax and social contributions, and that employment – or whether migrants are working or not –is the most important determinant of their fiscal impact. In an aging Finland, the question should not be to limit the number of immigrants when there are sectors where the employers are not able to replace retiring workers, but more how to push the immigrants to work, so that Finland’s finances are better balanced. For example, the rate of unemployment for Somalis, Iraqis and Afghans (who are mainly refugees) is over 50%, which means that their cost is high for Finland. For Russians, it is more than 25 %, which is also a problem. On the opposite side, Indians, Nepalese and immigrants from western countries have a better employment rate than Finns, thus are very useful for Finland’s budget. The same goes for Turkish nationals in Finland: one third of residents of Turkish origin run their own businesses. Among native Finns, that figure is only 10%. So the campaign has begun, and it would be interesting to see what will happen in the Finns’ party: will there be some kind of strong push on immigration? Will Halla-aho view prevail? And moreover will the election confirm the decline of the party, which may be a problem for Soini? ‹ Finland pushing for the Transatlantic Trade and Investment Partnership: a topic for the next elections?